Pure Pershing style is the best synthetic recapitulation for presenting the Pershing 90', the most recent superyacht launched by the Mandolfo-based yard. The sporty nature of this big open yacht is capable of raising strong emotions. 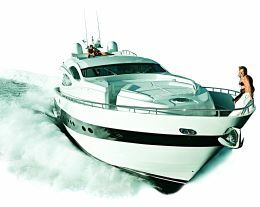 Her design is a typical representation of the brand's family feeling: a set of trendy balanced curves and straight lines, awarded by critics but most of all by Pershing Owners, as shown by the worldwide success of the whole range. Range at cruising speed: 370 miles. For information contact: Pershing, via J.J. Pershing 1/3 - 61037 Mondolfo (Pesaro, Italy) - tel. 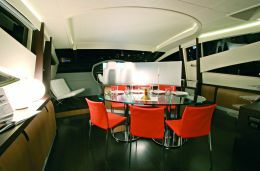 +39 0721 956211 - website: www.pershing-yacht.com - email: info@pershing.com. The fortunate partnership between Fulvio De Simoni - prolific designer and excellent representative of the Italian design applied to yachts - and Ferretti Engineering continues and gives birth to this new Pershing 90'. 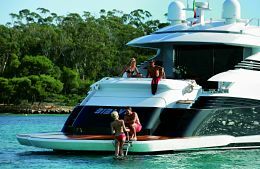 Ferretti Engineering is the technical and design firm of the homonymous group headed by Mr Frabetti and by Tilli Antonelli, the real soul of the Mondolfo-based yard. In the above-mentioned partnership each party demonstrated to perfectly interpret its own role by proposing a series of models hallmarked by the Pershing brand of indubitable esthetic appeal, capable of offering excellent seakeeping ability and high standards of quality as far as construction materials, interior layout and decor are concerned. In general, winning teams should be left untouched. Yet, regardless of the "homework's difficulty", we did carry out our job: as a matter of fact, this Pershing 90' competes with fierce rivals without paling in the comparison as regards technical features and esthetics, not even when compared with the range's flagship, the Pershing 115'. Even their debut was identical: they gained the limelight in consecutive seasons in Cannes, during the Festival de la Plaisance after which they continued the tour and participated in the most important international shows as real prima donnas. Holding in consideration the due proportions these two yachts are quite similar. Outside, the forward deck layout is slightly different. Both have a forward dinette, but in the 90' model it replaces the sunpad which is fitted forward, thus offering easier access and greater protection for sitting passengers who may be sheltered from the sun thanks to a power stowaway shade. What typifies the Pershing 90' is her unquestionable sporty nature. Her speed is expressed by a specially designed hull, by the almost 4,900 horsepower and by the surface propellers which discharge most of this power enabling the yacht to sail at a maximum speed of 44 knots. Performance is manifested by her shapes through the balanced combination of straight lines - the rake of the bow is enhanced by the dark stripe running along the hull sides - and the soft curves of the superstructure whose dark glasses starkly contrast with the white supports. Just like the 115', the distinctive marks of the side view are the three vertical glass windows on the hull sides, which let us imagine the presence of the owner stateroom, generally the largest cabin on board and for this reason beam wide. Even the flying bridge of the 90' follows in the footsteps of the 115': it is small, without outside helm station but with a settee fitted astern and a large sunpad - thus totaling three sunbathing areas with one forward and one in the cockpit. From the flying bridge we descend to the saloon through a steel and Plexiglass ladder. This ladder is so beautiful as to appear like a low-impact decorating element, it has no handrail and it is perfectly integrated in the yacht's refined and never extreme minimalist interior styling. Astern there is the ample living room with leather sofas looking towards the opposite side where there is a cabinet containing a stowaway plasma TV screen. 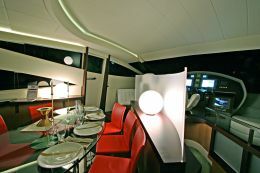 To port, there is the interior dining area. 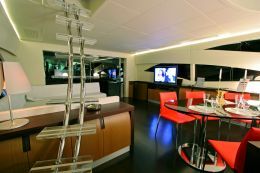 Both spaces are on the same level and include oval-shaped crystal glass and steel tables, in line with the ladder. The sofa, flooring, bulkheads and ceilings are white while the chairs are red. The dark wengé and light open pore finished oak floorboards create special contrasts with the furniture in all spaces, most of all forward, in the helm station. In addition to the nice and fully-fitted dashboard, the helm station includes lateral settees turning this a convivial space where one can share the pleasure of the passage. On the lower deck, reached through a ladder fitted near the helm seats, the Pershing 90' layout is quite typical of boats of this type. 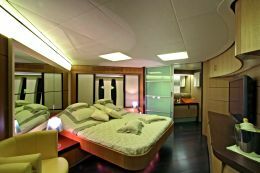 The master stateroom is aft, with the double bed laid diagonally just like the etched glass pane separating the suite from the bathroom that includes two crystal glass sinks, an ample shower stall and separated toilet and bidet. Going forward there are first two mirror twin guest cabins with en suite bathroom and then the VIP stateroom again with the double bed laid diagonally and en suite bathroom. 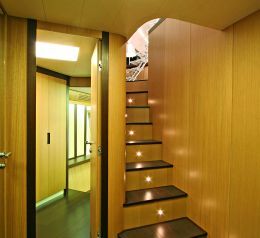 Descending the saloon aft ladder one reaches the galley and the crew quarters. This aft area of the lower deck appears to have been created with painstaking care as regards style and fittings: the wooden and steel galley is very bright and fully fitted, the crew cabin has twin beds laid one across and one longitudinally plus there is the crew bathroom. The cockpit is well connected to the saloon - separated only by a tempered glass door - and features a settee, a large table, a chaise-longue and cabinets including ice-maker and barbecue. Finally, the garage - fitted under the engine room and large enough for a dinghy and a PWC - has a noteworthy opening port. It can be opened without troubling those laying on the sunpad and launching and hauling are facilitated by the aft platform which can be lowered to water level.